This trip is one of its kinds designed to offer you an exhilarating pan-Bhutan experience, starting from the western flank of the country to the extreme east, and a whole lot of landscape, culture, flora and fauna in between. This trip takes you across the East-West lateral highway, a journey covering more than 1,000 kilometers across four major mountain passes, different dialect-speaking communities and settlements, different cultures and way of life, and a mesmerizing landscape and an ever changing flora. At every stop, you will experience something that is unique yet deeply central to Bhutan’s rich cultural heritage. 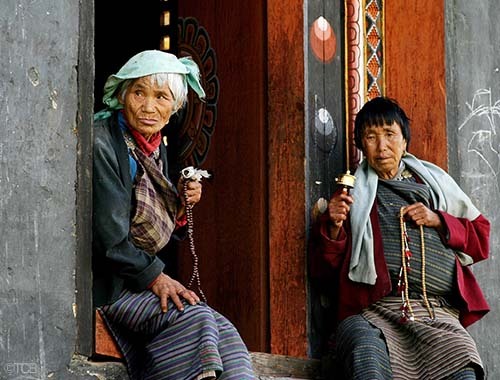 This trip will expose you to a million experiences that make Bhutan! A 15-day road trip across the Himalayan Kingdom of Bhutan can be daunting as well as exhausting. That’s what you are thinking, right? 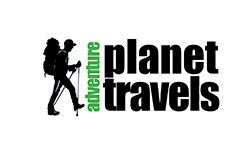 But come to think of this, no other trips provide a holistic experience as this one. In fact, this trip combines together many other short trips, presenting you with the opportunity to explore Bhutan in its entirety, from east to west. You will start your journey from Paro, travel across central districts, explore eastern districts and head back to Punakha and finally exit from Paro. It’s one full circle. You will visit the historical Paro Rinpung dzong, the seat of the powerful Paro Penlop (governor), who once governed the western part of Bhutan. You will visit the interior of the fortress and the inner sanctums. 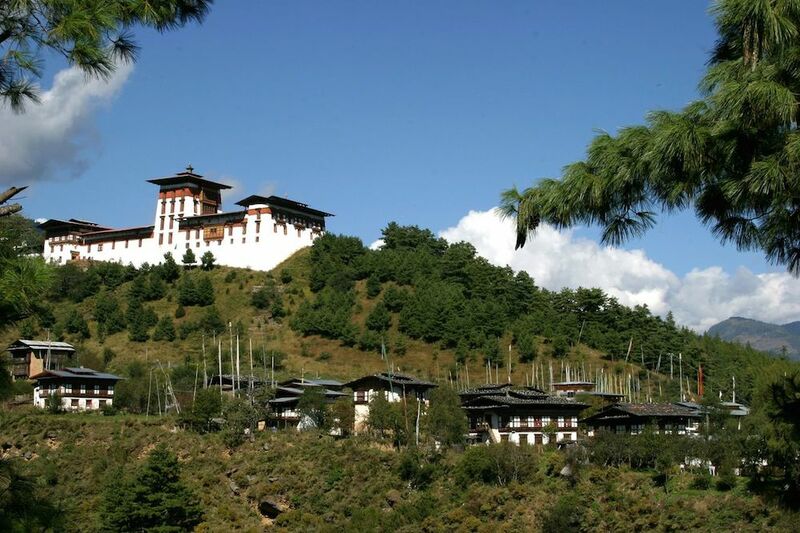 From there, you will take a short hike to Paro Ta dzong (watch fortress) whoch now houses the National Museum of Bhutan. After a sumptuous lunch, you will travel toward the north of Paro to visit the ruins of Drukgyel Dzong. The skeletal remains of the dzong, still standing tall on the ridge, celebrates Bhutan’s victory over Tibetan forces in the 17 century. While returning, you will a short detour to visit one of the most sacred and odlest temples in the country, the Kyichu Lhakhang. In the evening, we will travel to Thimphu. The journey takes about an hour. Relax and enjoy the ride. Thimphu has quite the potential to shock you, particularly if you have come with certain preconceived notions about Bhutan as a remote hermit Kingdom or the last Shangri-launtopia. Here in Thimphu, you will come across modern and traditional cultures, perfectly in harmony with each other. That’s the beauty of this small city of over 120,000 people. Take a stroll along the streets of Norzin Lam and you will certainly see that this is a kingdom that has not just come out of its years of hiding but is also desperately trying to play catch-up with rest of the world. It’s going to be a busy day. As usual. After all, there’s so much to see, experience and live out. That’s why we start early. 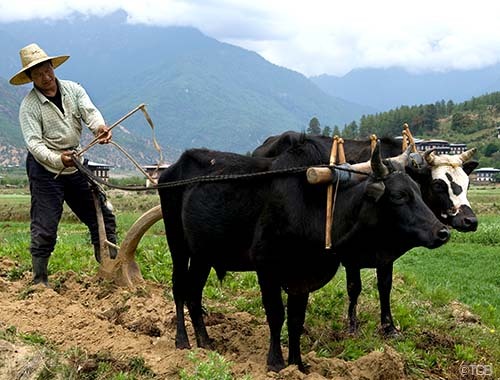 After a quick breakfast, you will visit the Folk Heritage Museum, which has rich display of household tools and appliances typically used by Bhutanese farmers. 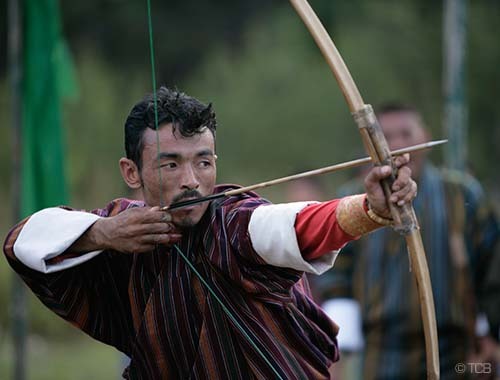 And from there, you will walk to the adjacent Institute of Traditional Arts and Crafts where Bhutan’s rich legacy of 13 arts and crafts are passed down to young students . After a delicious traditional lunch at the Folk Heritage Museum restaurant, you will visit the 13th century ChangangkhaLhakang, perched on a ridge overlooking Thimphu. Following the visit, you will visit the Motithang Takin Preserve to see the unique national animal of Bhutan, Takin. And from there, a short drive will take you to Sangaygang Viewpoint, from where you can enjoy the bird’s eye view of Thimphu valley. Thereafter, you will visit the National Memorial Chhorten, built in 1974 in memory of Bhutan’s third King. Later, you will take a short drive to Kuenselphodrang, the site of the tallest bronze statue of Lord Buddha in the world. In the evening, you will visit the inner sanctum of Thimphu Tashichhodzong, the seat of the Monarchy and the central monastic body. Today you will embark on a daylong journey toward the central district of Trongsa. This journey spans rugged mountains and rapidly changing landscape of breathtaking flora and fauna. After around 45-minute’s drive, you will reach Dochula pass with 108 Buddhist stupas, sitting still as if watching over the mountains. 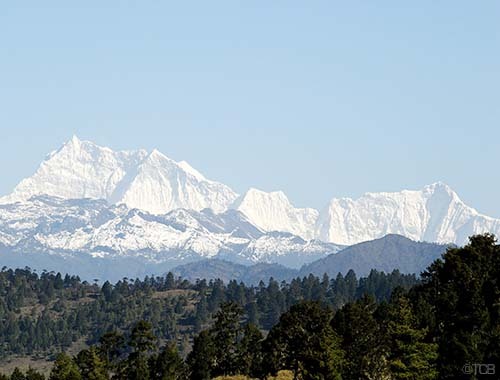 We will stop here for a brief while to enjoy the panoramic view of the snow clad mountain peaks and for a cup of hot coffee at the Dochula cafeteria. After an hour and half downhill drive through serpentine roads, green mixed forest and village settlements, you will arrive in Wangduephodrang district, the center of sha valley. You will make a quick stopover here and then continue the journey that takes you through beautiful valleys and deep forest until you reach the landmark Pelela pass that geographically divides the east from the west. Here, you will be treated to a hot outdoor lunch. The journey then descends through semi-nomadic settlements. When we reach ChendibjiChorten, a replica of the Boudhanath temple in Kathmandu, we will serve you hot cup of coffee/tea and snacks. From here Trongsa is just a two-hour drive away. Early in the morning, you will be taken tosouth of Trongsa to visit the historic Royal palace of KuengaRabten, the residence of the second king of Bhutan. On your return, you will visit the Trongsa Dzong followed by Ta Dzong overlooking the giant fort, now housing a museum. Towards afternoon, you will be driven to Bumthang. 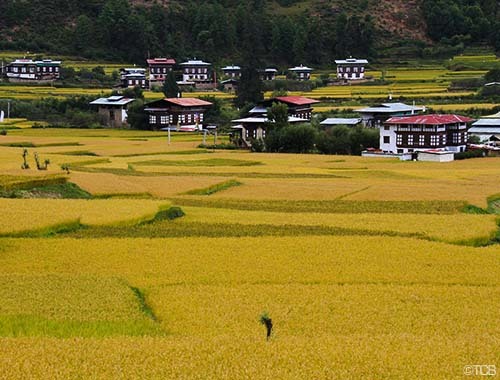 Bumthang Valley derived from the dzongkha word bumpa or vase offers endless opportunities to experience the cultural and religious legacy of Bhutan. In fact, Bumthang is among the most spiritual districts in Bhutan, known for innumerous Buddhist temples that celebrate the life and time of many enlightened beings who blessed the valley. In the morning, we will visit two most revered temples - Kurje Lhakhang and Jampa Lhakhang. 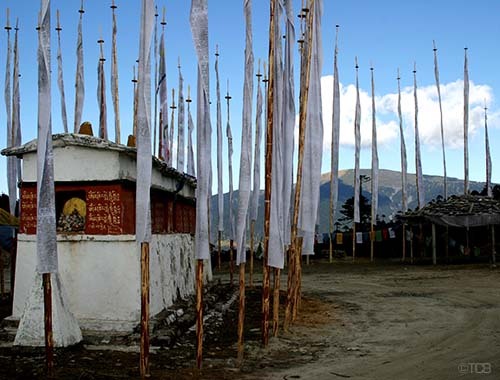 Kurje was built to commemorate the victory of Guru Rinpoche over a local deity while Jampa Lhakhang was built by the Tibetan Dharma King, ThruesungDetshen, in the 6th century. This temple is among 108 temples built by this King in one day. The other one in Bhutan is Kyichu Lhakhang in Paro. After lunch you will visit Jakar dzong, overlooking the picturesque valley. The fortress serves as the seat of the civil administration and also as the residence of the district monk body. In the evening, you will take a stroll around Chamkhar town, a small sleepy town. Today we leave central Bhutan for the east. 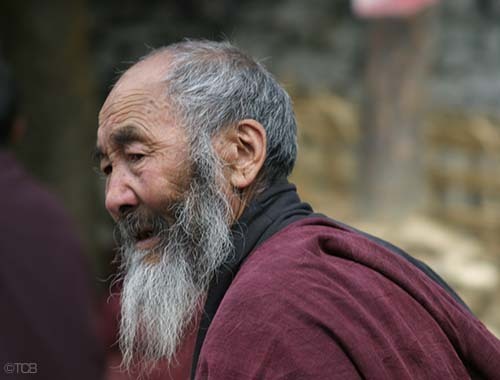 People of all eastern districts speak ‘sharchokpa’ or loosely translated as ‘the language of the east’ with few exceptions. Culturally, the region is quite homogenous and people from this region are generally known to be soft spoken. The east has a rich tradition of weaving and some of the finest textiles such as Kushuthara – the exquisite female kira with complex yet appealing designs, motifs, and patterns – come from the east. 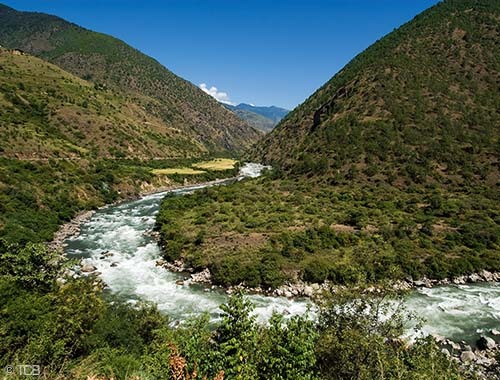 The journey to eastern Bhutan is like taking a walk in the woods - the serpentine roads cut across deep valleys, mountains, waterfalls, lush vegetation and precarious cliffs. The whole journey will appear as a cinematic display of overwhelmingly impressive landscape and scenery. On the way to Mongar, you will make a brief stopover at Thrumshingla Pass, the highest point on the journey. The whole of this area is designated as Thrumshingla National Park, a rich ecosystem of plants, birds and animals. The White Bengal Tiger and rare birds have been spotted in the national park. As we descend, we will reach the picturesque valley of Sengor where we will have outdoor lunch. After a few hours of travelling, we will drive across the famous precipice known as NamlingDra (cliff). You will be able to witness the ruggedness of the cliff as well as appreciate the wild beauty of namlingDrawater fall. As we further decend, we reachLingmithang, a birding paradise to explore its rich natural biodiversity. You will view the ruins of Zongar dzong on the way. We will halt for the night in Mongar town, one of the bigger towns in eastern Bhutan. In Mongar, we will visit the Mongar dzong and Yagang temple. Following lunch, we will drive to Trashiyangtse, the winter home of the endangered black necked cranes, the land of traditional platter and cups, and the legendary ChortenKora temple. The journey will take you across breathtaking landscapes through a road that twists and turns cutting across a rich pine forest. Along the way, you will come across traditional rural settlements on hilltops and valleys. Enjoy the sights and sounds! Trashiyangtse is a cultural center of the east, popular for woodcrafts. No wonder, that’s why there’s an Institute of Zorig Chu Sum here, which you will visit during the day. We will also visit Dongdi Dzong andChortenKora. On your journey back to Trashigang in the evening, you will visit GomphuKora temple by the riverside. Trashigang is a hot tub of cultural and ethnic diversity. Here you can come in touch with the highlanders of Merak and Saktengin their unique attire. 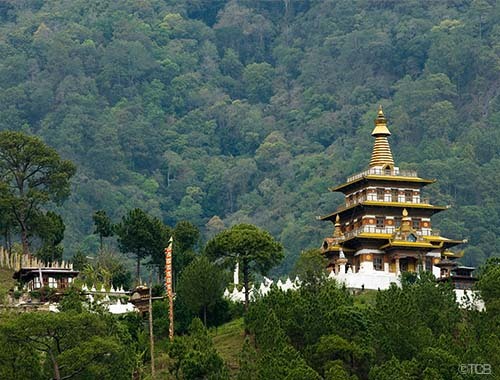 Trashigang also offers a variety of cultural tour and hikes. We will visit Radhi village, a very popular place for the production of locally woven silk garments in the country followed by a visit to Rangjung monastery and the historic Trashigang Dzong. We will also take a short excursion to Yonphula Lhakhang. We will start early. Today we will cover almost 300-km of road till Bumthang. We will stop for lunch in the in the scenic valley of Sengorand stop at the Thrumsingla – the highest point on the road – to take photographs. We will then make a stopover at Ura valley and visit the community temple. We will reach Bumthang by late evening. The rigor of the journey doesn’t stop here. We will start off early in the morning for Punakha. On the way, when we cross Pelela, we will take a detour to the valley of Phobjikha, the winter home of the globally vulnerable black necked cranes. We will visit the Gangtey Monastery and after that head towards Punkha. Punakha is the erstwhile capital of the country. The grand PunaDewaiChenpoiPhodrang or the Great Palace of Happiness located on the confluence of two rivers – Phochhu (male river) and Mochhu (female river) is one of the finest products of Bhutanese architecture. 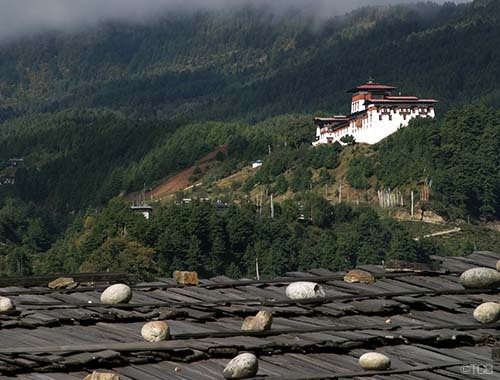 This fortress houses the preserved body of Zhabdrung, the theocratic leader who unified Bhutan in the 17 century. The coronation of the first King of Bhutan was held within in the walls of this magnificent fortress. The dzong is also the winter residence of the chief abbot or Je Khenpo. After breakfast, you will visit the fortress and visit the kuenray, the main temple. This impressive temple features massive wall paintings of thousand Buddhas, life of Lord Buddha, fabulous display of past abbots and the giant statue of Guru Rinpoche, Buddha and Zhabdrung at the forefront. 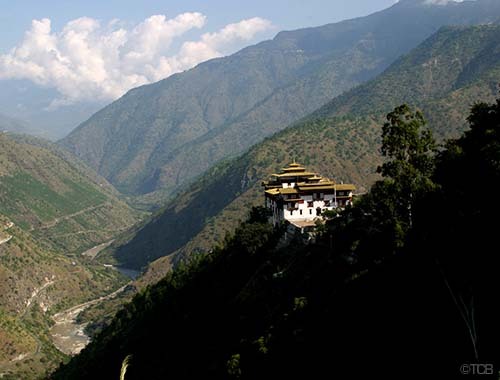 After that, you will be driven for a short excursion toward the north of Punakha valley. A short hike will take you to another architecturally exquisite structure called the KhamsumYuelayNamgyalChhorten at Hebesa. 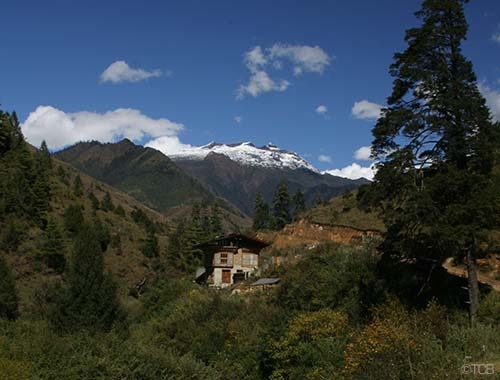 Following your lunch at Lobesa, you will visit the famous Temple of Fertility or Chimi Lhakhang. This temple is built in memory of the divine mad monk Lam Drukpa Kuenley known for his crazy wisdom and unconventional way of teaching Buddhism, through explicit sexual innuendos. 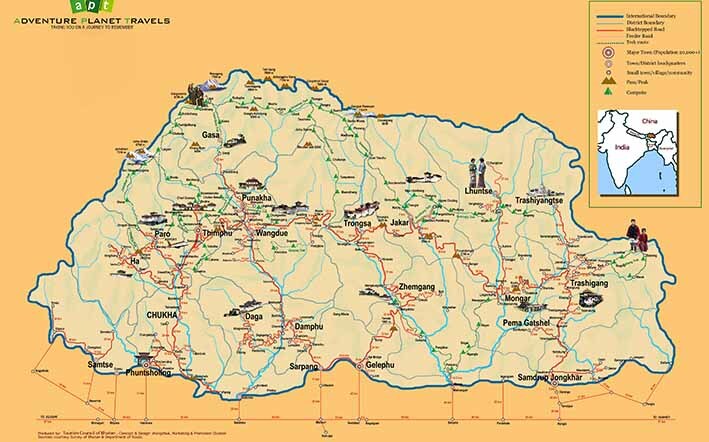 Today, we will drive toward the north of Thimphu. From the road point, we will hike uphill to Tango monastery, the leading Buddhist University in the country.The trail runs through a beautiful mixed forest. At Tango monastery, we will visit Buddhist shrines. We will also witness young Buddhist monks learning Buddhist studies. After the hike, we will drive to Paro for the night halt. Perched on a precarious cliff, 1000 meters above Paro valley, the iconic Tiger’s Nest or Taktshang as it is locally known, is by far one of the most spiritually significant sites in Bhutan. Legend has it that the 8th century Buddhist saint Guru Rinpoche is said to have flown to this cliff on the back of tigress, and meditated in the cave and vanquished the evil spirit, converting them into protectors of dharma. The Tiger’s Nest is 3-hour’s hike from the base along a trail that steadily rises cutting through mixed pine forest. Once at the Tiger Nest, you will be escorted to various shrines within the temple. After enjoying the view of the valley, you will revert. Lunch will be served at the cafeteria. In the evening, you will stay at a farmhouse, soak in hot stone bath to relax your fatigued sinews. Dinner will be served in a traditional manner accompanied by a cultural programme of songs and dances. Your tour executive will see you off at the airport. Bon voyage!